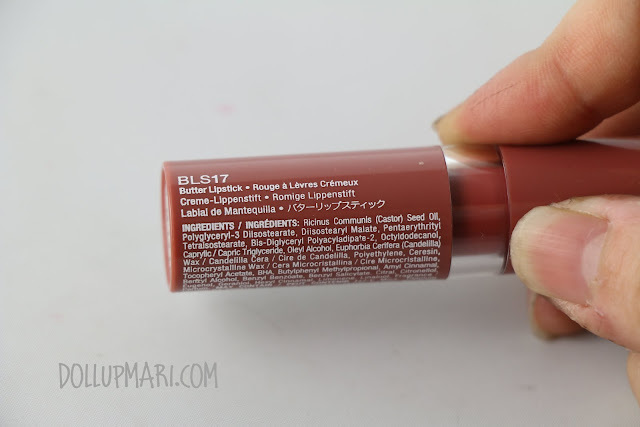 Hooray for another MLBB lipstick! 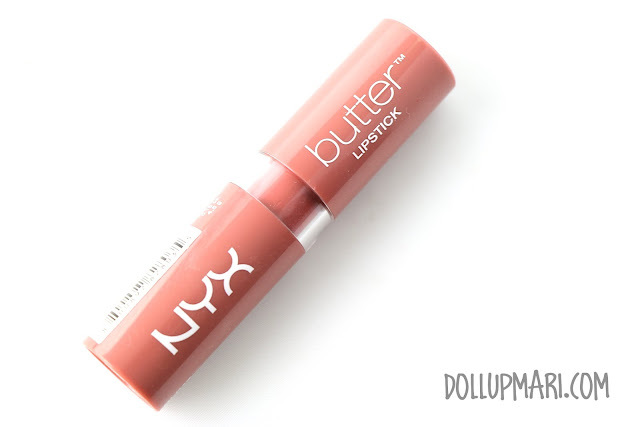 I ordered this NYX Butter lipstick shade primarily because it's an MLBB shade, and at the time I ordered it there weren't much feedback on this product yet which is why I decided to buy it and see for myself. This is me sporting the lipstick. I love the color! It's an MLBB shade alright, but contrary to many of my other MLBB shades, this is not pinkish in undertone but brownish based. When I checked it out in the internet, with the limited blog entries I saw, I thought that it was pinkish base. In general, I personally like pinkish MLBBshades which is why I went for it. The moment I opened it and checked the color out, I was actually a bit worried as it was more brownish than I had expected, I was thinking that it might not look as nice as I had thought it would look like. 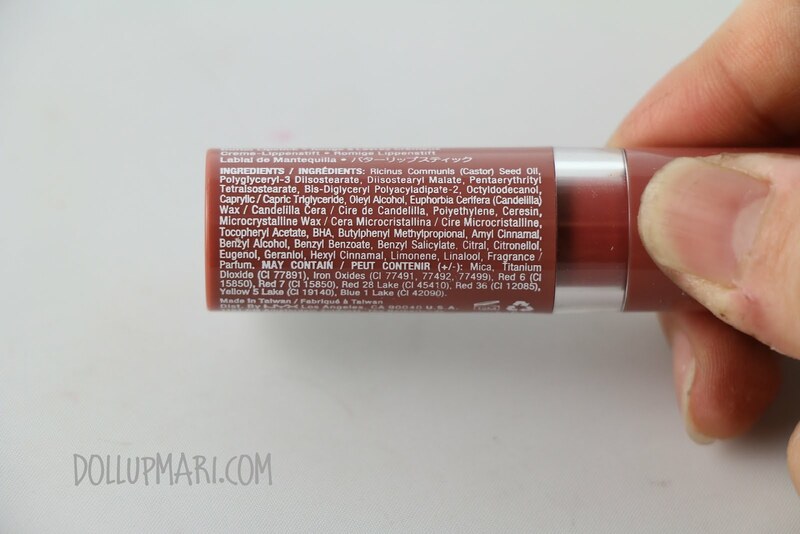 At the bottom of the lipstick is also another name. This shade is in Pops, but apparently it's also called BLS17. These are the ingredients, and thankfully it's made in Taiwan! I was initially curious about the scent because I could not really pinpoint what it really smelled like, until I saw cinnamal (cinnamon), limonene (lemon or orange, depending on stereochemistry), citronellol (citronella) and linalool (lavender) in the ingredients. Apparently it's a combo of so many fragrances. It smells really unique, but isn't too strong or pungent. When swatched on my arm, this is how it looks like. In general, it's got this brownish red color when swatched really heavily, and when you just get the essence of its tint, it's a brownish colored tint. However, the nice thing is how it interacts with my lips' natural color. 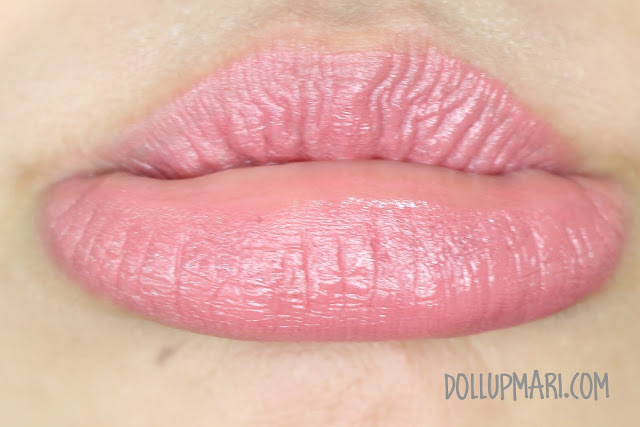 It's not a 100% opaque lipstick, which is why it's able to provide color to the lips while making use of the pinkish tones of the lips to produce this really nice shade. I am actually really happy with how pretty this shade is. 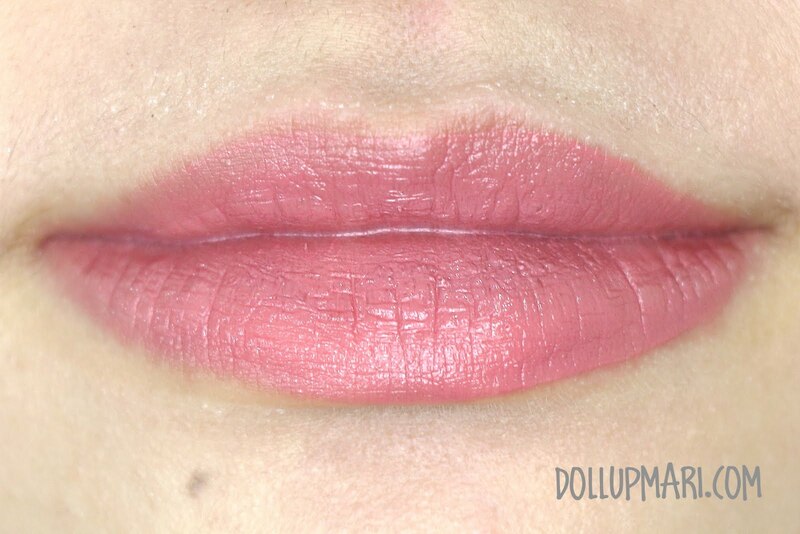 And since this is an MLBB shade, this is an illustration of how the color fares relative to my gums. You know that a lip color is a good MLBB color when it perfectly matches your gums or is really close in color, which you can see with this lipstick. 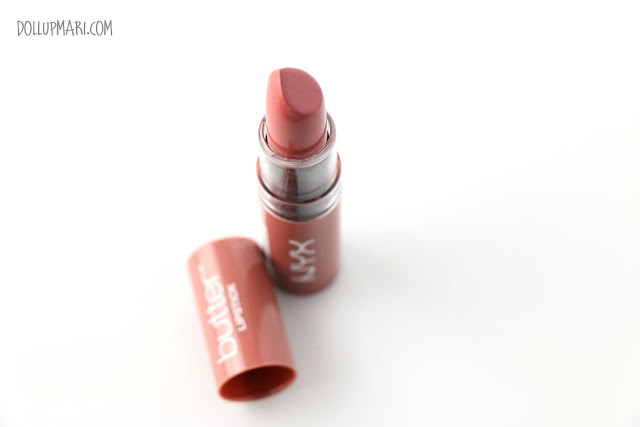 Comfort wise, the lipstick is really comfortable on the lips-- it's not too slippery that it feels oily or greasy on the lips, but it also doesn't feel as heavy as my other lipsticks. The only concern was longevity though. I had to reapply every hour or so or after drinking or eating anything because the lipstick dries up really quickly, and with it the color also fades quite fast. This may be a lipstick but it may pass better as a tinted lip balm. What can you say about this? 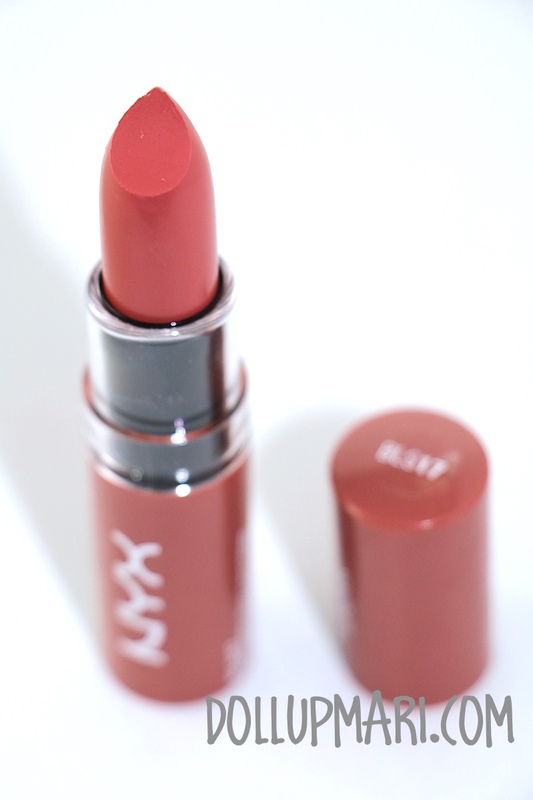 Personally, I really love the lipstick because of its color and comfortable wear. 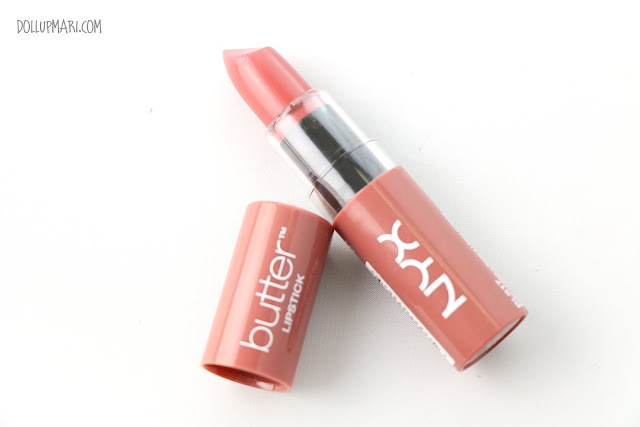 This may not be my go-to lipstick for clients or for parties where I want something more long lasting, but for everyday use or as a colored lip balm, I really love this product! I got this for Php235 from NYX Wholesale PH, and given how low that price is value for money is out of the question as it's so affordable. You can also try to check this out in the NYX outlets here in the Philippines, but I'm not sure if they've brought this in yet or if the price is good. 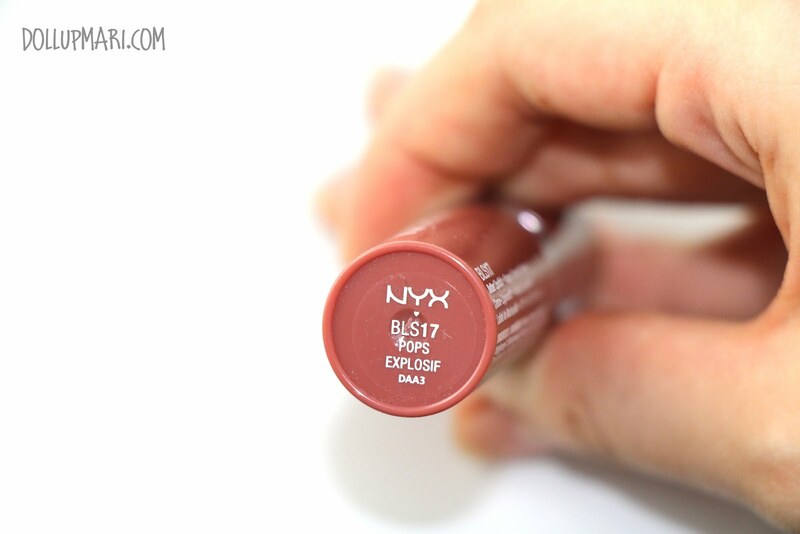 If you're not in a rush (as in you can wait about a month and a week), you can definitely order from NYX Wholesale PH. 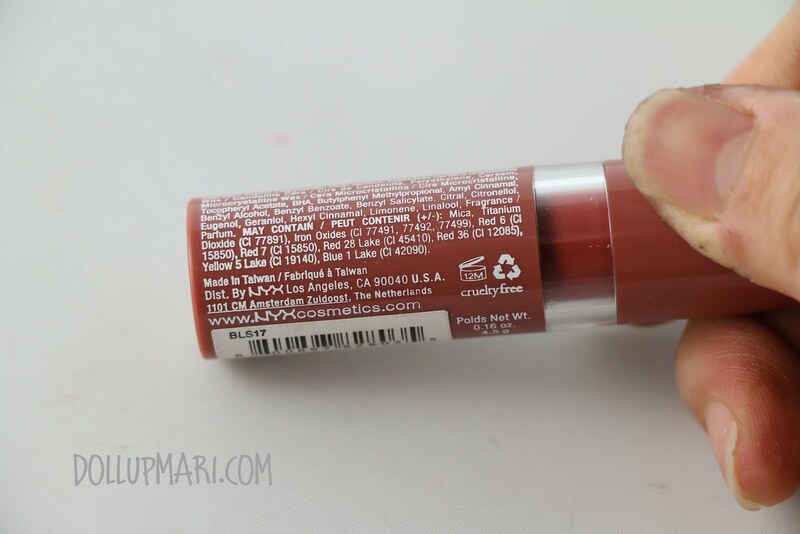 Have you ever tried a brownish MLBB shade? Please do tell me in the comments box!